With a wealth of experience, we are able to offer a full consultation service to allow you to see the potential impact your premises could have. We will work with you to ensure the end result is both aesthetically pleasing and practical. We offer a range of solutions from composite panels to vertical cladding solutions and we will be happy to discuss your requirements with you. Many buildings require substantial renovation during their lifetime. The cladding may fail or deteriorate to such an extent that extensive replacement or renewal is needed. Overcladding is the renovation of a facade by the addition of new skin over the original external fabric. Where an industrial unit is in a poor state of repair, looking tired, suffering from damp and moisture penetration a cost effective solution is to overclad the existing building envelope with profiled colour coated steel. This can be further enhanced for little or no extra cost by incorporating contrasting flashings, guttering and closures. Insulation can also be incorporated into these works to give the client future cost benefits in energy reduction. For an even more modern look the incorporation of insulated flat panel will offer even further fabric enhancement. Harmony Roofing Services are highly specialised in this field and are able to offer our clients an endless combination of materials, profiles, finishes and colours to give the building a totally unique and individual look. Given the increasing complexity of buildings envelopes, wide range of available materials and improving performance standards, a new discipline of facade engineering is emerging that treats the facade with the same care as services and structure. Over-roofing is a cost effective, accepted method of providing a new roof with the minimum of disruption to your business activities beneath. Over-roofing can be applied as a standing seam/secret fix system especially suited to low pitch roofs or in a traditional trapezoidal profile. When opting for an over-roofing system consideration should be given to the existing internal roof lining, as it will remain. Harmony Roofing Services strongly recommend that any existing rooflights on the roof be renewed prior to over-roofing. We have designed and installed hundreds of successful over-roof systems. 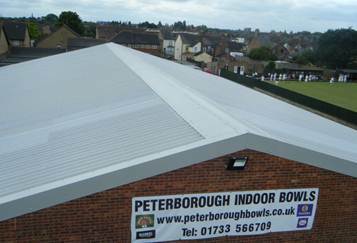 Because we specialize in industrial roof refurbishment you will be in safe and experienced hands.